Warning: Before you start reading this short description of my one-day organisational workshops, I would like you to understand that I do not assume that one day can produce an “organisational masterpiece”! This concept can be seen in most cases as a far distant star, shining on the path of co-creation process in a company. But we need inspirational goals for beyond imaginable! As it hopefully happens to every one of us at some point in life, to be overwhelmed and drawn into whirlpool of totality engaging genius, changing our life forever after: To me it happened when I was 12 and experienced for the first time a concert performance by legendary violinist Henryk Szeryng…..true inspiration can last for a life time! IGNITING A VISION FOR AN ORGANISATIONAL MASTERPIECE! If we compare symphony orchestra with a commercial organisation, we find similarity on first 2 levels: First, both are structures of human interactions – the individual is the smallest building block. Second, both consist of teams. Individuals must constantly improve in order to be capable of participating productively in a creative team. The difference sets in on a the third level, the WHY of the “performance”: The “music” of a company is often written just on ONE (bottom-) line, while musicians perform a polyphonic masterpiece written on 5 lines! The meaning, beauty, power and profound depth of a masterpiece pulls musicians instantly and passionately to the highest, genius, resonance platform of heart, while managers often struggle to reach the starting point of an aspiring artist: technical excellence and rational targets. Applaying formative forces of Art on leadership floor experienced breakthrough and crystallized to a specific method when I played my violin in the King’s Chamber of the Cheops Pyramid. In the heart of this pyramid the most powerful resonance on earth melted my decades of performing in magnificent ancient temples, cathedrals and other extraordinary spaces into a single realisation: RESONANCE!!! This is the axis, the “Archimedes Lever” https://www.math.nyu.edu/~crorres/Archimedes/Lever/LeverIntro.html , to lift and drive the vision of organisation to the highest masterpiece-like potential with extraordinary value added, meaning, beauty, answering employees with flaming “WHY” and inspiring every leader to dare becoming a “composer of one’s own biography as masterpiece”! How do we, as leaders, mobilize the inner power to persue such lofty goal of organisational masterpiece? The Cheops pyramid with her inner mystery of resonance reminds us also of Maslow’s human dynamics: it feels “natural” to be constantly stuck in the sphere of basic needs at the bottom (eating drinking, budgets…) and forget the pursuit of the highest ideals at the top: self-realisation, meaning, highest creativity, unconditional love and genius. But it is this inner striving of a leader which generates a powerful impact! What is the “trick” of uncompromising artist (potentially in every human being)? We simply flip the pyramid upside-down and motivate ourselves for highest ideals to become our basic needs and we act, we create out of that uncertain balancing point, the ever improvising bottom-line, the source of inspiration. To lead innovation, re-invention, real change and transformation of the company: practising this inner condition is the answer! 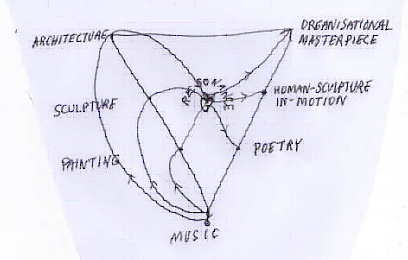 The flipped pyramid can be divided in 7 dynamic fields of forces, emanating totality and diversity of arts, starting with 1) architecture, then 2) sculpture, 3) painting, 4) music, (at the bottom), 5) poetry, 6) social-sculpture-in-motion and….the future “queen of the arts”: 7) society-as-art, or architecture of human relationships, the organisational masterpiece. Descending on the left side from 3 dimensional architecture over 2 and 1 dimensional sculpture and painting we enter the entirely inward sphere of music, resonating like the element of fire, potentially present in all forms of art. (We can “hear” the proportions, colours and rhythms of architectural, sculptural and painting etc. masterworks!) . Now the dynamics of Music sets in, penetrates the painting, drives its colours, shapes and rhythms through the resonance of the pyramid’s heart and on the other side emerges the drama of poetry. Likewise music, through the force of resonance releases fixed sculpture into the motion of “social sculpture” and finally, music transforms “Karyiatides” ( Bilder zu karyatides ) from their static architectural role to the not-yet-present, all-encompassing future form of art: human relationships as ART, the co-creation of the organisational masterpiece! And here my method in practical terms: I follow the ideal to create such experience environment for the clients to enable them to invent and implement their own solutions. They usually want to change from the existing, current organisational structure in the upper left corner to the desired future on the right side. But, as well known, the fastest way to the goal is through a creative detour! And on this detour we attain unexpected insights and capabilities. 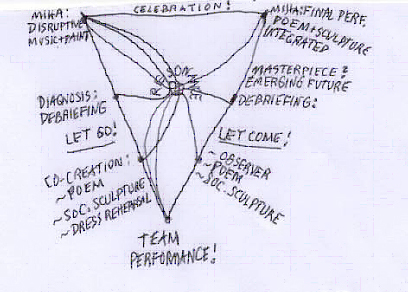 Receiving in-depth briefing from clients gives me an idea of their organisational architecture and the participating leadership teams of my workshop consist of individuals with historically determined “job description” roles (sculpture). Architecture and sculpture represent the organisational status quo on the upper left side of the upside-down-pyramid. Stage one: We start with a journey of masterpiece experience through very distinct 7 stages of musical implementation strategy. (See“Theory U”by Otto Scharmer, MIT). It is very moving for participants to experience this strategy interdisciplinary, music reaching with “gentle-power” directly into human feelings. Touching the feelings is a MUST, or we get stuck in the change process! This journey from letting go of status quo to letting come of open mind, open heart and open will is supported through my disruptive method of performing masterpiece, directing participants’ listening attention and painting the process, all at the same time. Participants are invited, at the end of this first stage, to share in conversation the ROI relevance of musical “diagnosis” to their organisational challenges, their change process and desired direction to be taken. Because art is not “dangerous and threatening”, suddenly a unique “resonance platform of catharsis” emerges, taboos are broken – even laughed about and great excitement sets in for the next stage! The journey from the left corner of the up-side-down pyramid, to zero-point of the “open will” at the bottom, has been completed. Stage two: Participants are divided in teams and given the task to co-create a poem out of combined freshly emerged musical-, visual- and company’s challenge- ideas. The poem is to reflect the journey from the status quo to the desired future. One person is designated as an observer. Only after completing the poem they are asked to co-create a “social-sculpture-in-motion”, that is, with the help of one designated “sculptor” the team extracts a choreography out of the poem, everyone present is involved in motion, dramatic-daring-suggestive-beautiful: but without words! Finale: Observers return with their creation and perform the crystallized content of the day, one could say, a re-invention of vision and mission and I conclude with the final performance on my violin. Then comes the dinner celebration of so very creative day! Thus the second part of the journey from the “musical open will” at the bottom to the upper right corner of the pyramid has been completed in co-creation of everyone present.